Apprentice Boys and bandsmen walked through contentious areas of Belfast's Ormeau Road and Ardoyne without incident on Monday morning. There was a low key security presence as the feeder parades passed. At Ardoyne shops in north Belfast, about 100 nationalist residents protested. The chairman of the Parades Commission, Rodger Poole, monitored the situation. 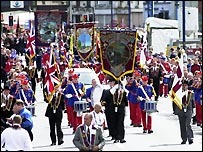 Up to 5,000 people are expected to attend the annual Apprentice Boys parade in Ballymena. The government-appointed Parades Commission was set up in 1997 to make decisions on whether controversial parades should be restricted. # posted by SAOIRSE32 : 4:39 p.m.